There are probably as many opinions on the subject of combat sights for semi-auto carbines as there are shooters. I’ve never been in “combat” with a semi-auto carbine, and I hope that I never will. I’ve never had any training in the tactical employment of the modern battle carbine either. So now that I’ve totally disavowed any kind of expertise on the matter, I’m going to tell you what I think anyway. How’s that for arrogance? The sum total of my experience with quick reaction sighting equipment has been in our club matches. These have been in Bill’s “Patrol Rifle” matches and in our Zombie shoots. We have also had various other “Action Rifle” matches of different formats over the years. So experience in our club shooting matches is the background context of my discussion here. Since I usually don’t do too bad in these club events, I hope that I can offer some small level of guidance to my fellow club members. We have another Patrol Rifle match coming up shortly, so that’s what has me thinking about this now. Between myself and my two sons, we have three or four semi-auto carbines that we have had the chance to scope with different types of sights. We have learned some strengths and weaknesses of different solutions. But first, let’s talk about what we want a combat sighting system to do, that is different from a hunting rifle scope or even a “tactical” (sniper-type) scope. It all comes down to one thing: speed of target acquisition – the shortest possible time from GO to HIT! And this speed must be employed from across-the-room distances to maybe 200 yards at the outside. Speed and precision, both short and medium long – how do you achieve that? There are three basic options for sighting systems for rapid reaction work: 1) iron sights; 2) non-magnifying red dot sights (RDS), including non-magnifying holographic sights; and 3) magnifying rifle scopes. All have their strengths and weaknesses. Blade and notch is the standard sighting system on defensive handguns. Defensive handguns are intended to be used in quick reaction scenarios. But on rifles, blade and notch is not an optimum quick reaction sighting system. Unlike handguns, combat rifles are expected to be able to hit quickly at extended distances as well as across a room. Since the introduction of the Garand, all U.S. military rifles have used an aperture rear sight at the back of the receiver. Actually, the M1905 rear sight on the 1903 Springfield rifle also had a peep aperture, but it was mounted forward of the receiver, and there it is difficult to use. With the aperture located near your eye, as it is on a Garand, the Springfield '03A3, or on an AR-15, putting the front sight post on target while looking through the peep hole will give you quick and accurate hits both close and distant. But the rifle must fit you comfortably and you must be skilled at mounting the gun. The rifle must come quickly and naturally to the shoulder so that the peep immediately comes to your eye. This is true for the other sighting systems as well, but it is doubly important for the small aperture of a peep sight. This is not too much of a problem with standard stocks, for example the AR15A2 stock. It can be a problem with collapsible or folding stocks which are optimized not for shooting fit and comfort, but instead are optimized for carrying compactness. At longer range, another limitation is the lack of magnification. You have to be able to see your target in order to hit it. At long range, the front sight is a coarse aiming point. But with practice, it’s amazing what you can hit at considerable distance with iron sights. One more limitation is for those of us with older eyes. I have reached the point that I need weak reading glasses to be able to see a crisp front sight image. So for us older shooters, an optic with adjustable focus might be a better solution. My son Sam won’t be around much to shoot in club matches anymore. On July 1st, he entered the U.S. Military Academy at West Point where he began his Cadet Basic Training. I am still in shock and awe about that. In this modern age of smart phones with built in cameras and social media websites, we have received a number of photos of him and his squad mates in basic training. 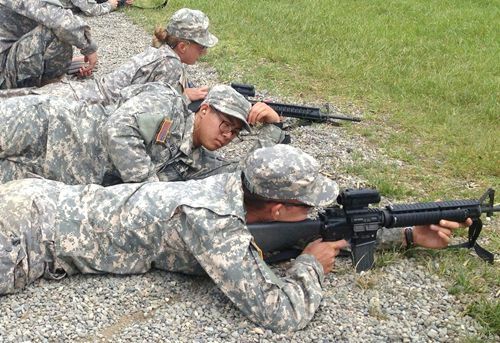 The cadets are issued M16A4s equipped with the M68 Close Combat Optic. To us civilians, the M68 is known as the Aimpoint CompM4. This is the Cadillac of red dot sights. 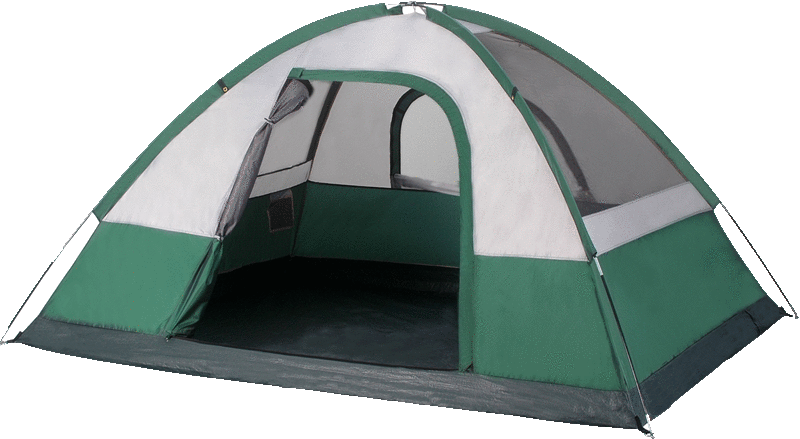 Right now it is priced on the MidwayUSA website at $813. Less pricey red dot sights have been popular with our club shooters for a number of years. I most frequently see them mounted on handguns at our club silhouette matches. For quick reaction work on a fighting carbine they are an excellent sighting solution out to about 100 yards. That illuminated red dot really catches your attention. The EOTech holographic sights are even better. They typically have a large circle surrounding a central dot. For close and fast, you don’t even look for the central dot. Just plaster that big circle on your target, press, and move on to the next. Pricing is high, but less than the M68 CCO. The other big advantage that makes the RDS a very fast sight is parallax forgiveness. You do not need to have the dot or circle perfectly centered in the field of view. As long as you can see the dot (or circle) on top of your target, squeeze the trigger for a hit. For longer range shots, holographic sights and red dots suffer from the same lack of magnification as iron sights. (Note that the Army calls the M68 a CLOSE Combat Optic.) A popular solution for that is a separate magnifier device mounted between the RDS and your eye. These magnifiers are typically mounted on a swing mount which allows them to be out of the way for close work, but they can be locked into the line of sight for longer shots. This strikes me as a kludgey and cumbersome solution, but to each their own I guess. In recent years, paralleling the explosion of interest in the AR-15 rifle platform, there has been an explosion of scopes that have come on the market targeted specifically for use on the AR-15 and other military style rifles. They have been of two basic categories. The first are the “tactical” target scopes with high upper-end magnification, usually mil-dot reticles, large exposed target turrets, and often a side mounted parallax adjustment knob. Since the topic of this article is quick reaction sights for fighting carbines, I won’t talk about those types of scopes here. The other type of magnifying riflescope that has stormed the market are of low magnification, typically around 4x. Many use a straight 30mm tube with no objective bell. Then there are the prism sights which do not use traditional tube construction at all, such as the Trijicon ACOG (Advanced Combat Optical Gunsight). Most scopes in this class have some sort of an illuminated reticle. While you can choose a mil-dot or other crosshair type reticle, you will find many non-traditional, non-crosshair type reticles in this class. In August of 2011, I wrote a Gear Review of the Burris AR-332 optic which I have mounted on my fixed carry-handle AR-15. I won’t rehash that entire review here, but let me mention a few points. 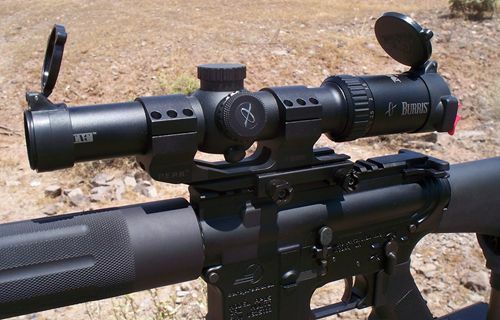 It is a fixed 3x prism sight with Burris’s Ballistic CQ reticle. 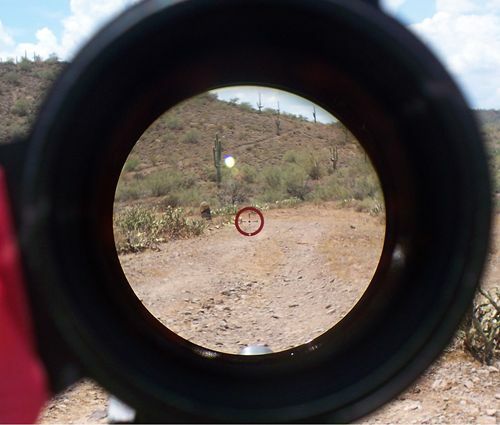 This reticle presents a prominent circle with a central aiming dot, but with additional ballistic drop dots below the center dot. The low magnification level paired with the illuminated Ballistic CQ reticle is a very effective compromise between the need for fast targeting up close, and more precise targeting at longer range. For close and fast targeting, I really like the bold illuminated circle and believe that it is among the best answers to the problem. Even better than the AR-332 is Burris’s MTAC scope. It is a 30mm tube scope of 1-4x magnification. It also uses the illuminated Ballistic CQ reticle. The MTAC has clearer optics than the AR-332, but it’s bigger advantage is variable power. At 1x, it effectively acts like a red dot scope or EOTech substitute for room clearing distances. Crank it up to 4x, bear down on the center dot, and you’ve got enough precision to hit small targets at 200 yards. Need to go farther still? Use the ballistic drop dots below the center dot. Now that’s versatility. But I said that all the combat optics choices involve pros and cons. What is the downside for a 1-4x variable scope like the MTAC? If you are transitioning from a close target to a long target, or maybe more critically, from a long range target to a close target (unexpected sudden threat), it takes valuable time to reach over and crank the magnification power change knob. You will see 3-gun competitors solve this problem in two main ways. The first is by bolting on a “paddle” on the power change ring. This gives you more leverage and a bigger thing to grab in a panic power change situation. The second solution is to add a 45° offset picatinny rail section to the gun. Mounted on top of that is a small and compact red dot sight. With this, all the shooter has to do is cant the gun 45°, plaster the dot on the close threat and squeeze the trigger. The 45° offset mount ends up placing the RDS over the bore when the gun is canted. Then it can be zeroed just like any other sight, but the zeroing is done from the canted orientation. There is another advantage to this kind of setup. The 45° offset RDS ends up located closer to the bore centerline than the primary optic. The basic design of the AR-15 forces the normal sighting plane to be anywhere from 2¾ to 3½ inches over the gun bore. This means that on close targets, your bullet will impact significantly lower than what your sights are telling you. Bill is notorious for including a close hostage target in his Patrol Rifle matches to trip up the unwary. He puts the hostage in front of the bad guy with just the bad guy’s forehead exposed. If the shooter does not compensate for the sight height above bore, the bullets will go through the hostage’s forehead if you aim directly at the bad guy’s forehead. You are forewarned! With a 45° degree offset RDS, not only is it closer to the boreline, but you can take advantage of its purpose as a close range sight only, and specifically zero it for say, a distance of 5 or 10 yards. But even without an auxiliary sight, with a reticle such as the Ballistic CQ, you could practice at close range to determine how to hold (maybe the bottom of the circle?) to make precise close range hits. The reticle type on the 4x Trijicon ACOG M150 RCO (Rifle Combat Optic) used by the military has a longer ballistic ladder to allow hits out to 600 meters, but it can also be useful for those close up hostage shield head shots like Bill is fond of setting up. So as you can see, there is a lot to think about in choosing a quick reaction sighting system for your defensive carbine. There are tradeoffs in capability, weight, bulk, and cost that you will need to balance. But most of all, personal preference and your own primary use scenario will steer your choice.